Here is an example chromatogram of polypropylene (or sometimes abbreviated as PP), a member of the polyolefins. The run conditions and some results are detailed in the table below. Chromatogram of Polypropylene in trichlorobenzene, 160C. Refractive index RI, low angle light scattering LALS, and viscometer trace shown versus elution volume. 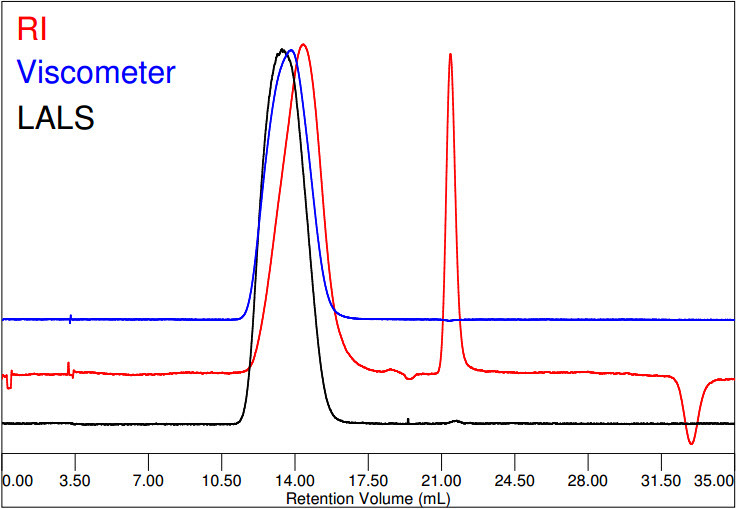 This sample of moderate molecular weight polypropylene is analysed on the Viscotek HT-GPC system at 160 °C. The chromatogram shows the excellent stability of the system and the low noise level of the light scattering (LALS) even at this high temperature in trichlorobenzene TCB. 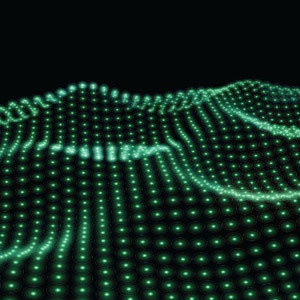 In this data set, the LALS scattering signal (obtained at a scattering angle of only 7º) is used for directly obtaining the molecular weight without any extrapolation. This is particularly useful when ansiotropy begins for large molecular weight polymers.